Corkscrew Shores isn’t your traditional community. We have taken the traditional community concept and enhanced it to feel like your home is a vacation destination. The community’s fresh coastal theme was designed to complement its 240-acre spectacular blue lake that is the centerpiece of this top selling development. Our state of the art amenities create endless opportunities for residents to gather and dine with family, friends and neighbors. Conveniently located between Naples and Fort Myers, Estero has become a leading destination in Southwest Florida with many upscale residential communities and the best selection of dining, shopping, golfing, and gorgeous gulf beaches. The area also has excellent primary and higher education opportunities, such as Florida Gulf Coast University, as well as easy access to Interstate 75 and Southwest Florida International Airport. Germain Arena, Miromar Outlets, Gulf Coast Town Center, and Coconut Point Shopping Mall are all just minutes away. 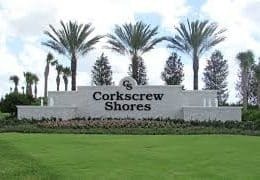 The quality of the homes, amenities and location, make Corkscrew Shores one of the most compelling and impressive options for buyers hoping to secure a home here in the paradise of Southwest Florida.